1. This is a privately owned unit and guests are renting directly from the homeowners whose company name is B&Z LLC (as will appear on your credit card statement). Therefore your reservation is non-transferable between other properties. b. Your on-island contact is Graeme D. Merrin, RB, ABR, GRI (808) 651-7211. 1. 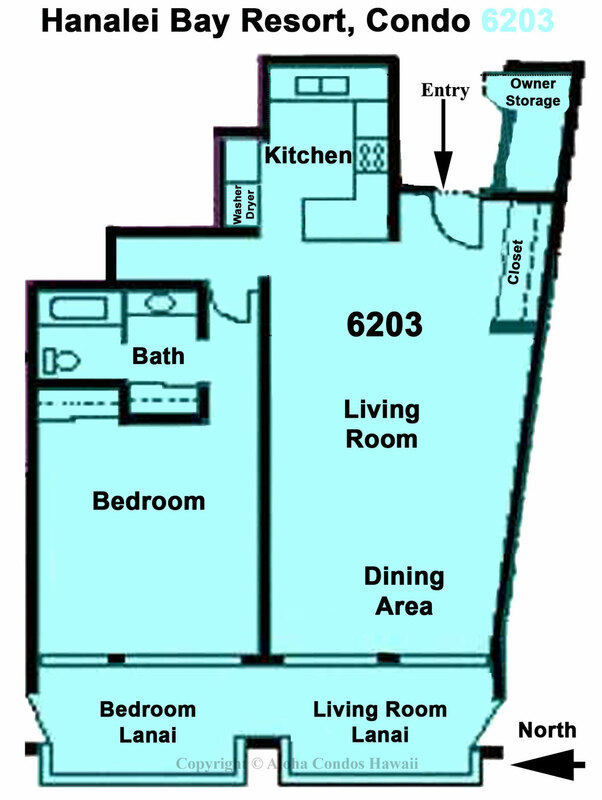 The regular occupancy for 6203 is 2, however 2 additional people can be accommodated on a sofa sleeper in the living room. The regular occupancy for unit 6204 is 2, and a 3rd person can be accommodated on the sleeper chair. The regular occupancy for 6203/04 is 4. The maximum occupancy for 6203/04 is 7. Guests are obligated to disclose the actual number of occupants prior to arrival. 11. We provide sheets for each bed and two bath towels per stated guest. There is no daily housekeeping service, but you are renting 6203 or 6204 you are welcome to use the washer/dryers in the units. If you have an interim clean included with your reservation we will launder the linens during the clean. Please do not leave personal laundry in the washer when housekeeping is coming for the interim clean. We really enjoyed our stay and loved the unit. The deck was fabulous. The complex is very nice and low key. Will stay here again. A gorgeous, newly remodeled (2009) and refurnished condo with an outstanding view of Hanalei Bay. All new furnishings including a 44 inch flat screen tv in the living room for you sports fans! There is a table and 4 bar-hight chairs on the lanai so you can enjoy your stunning view while you dine. There is also a pair of chez lounges outside the master bedroom for those who like to nap or read in the shade of the covered lanai. Best View of Hanalei Bay! Bistro style table seating for two with views better than most resaurants! Dine with the best views of the Bay! Renew your senses with the scent of plumeria, enjoy the fresh breeze, listen to to birds chirping and palm frawns swaying, while admiring the vibrant rainbows and glistening waterfalls. The staff were wonderfully friendly and helpful even with our delayed 4:30am arrival. The grounds were clean and beautifully maintained. Tennis courts were nice. Beach was beautiful. The condo, while large and open, needs the carpets removed. They were very musty. Even with the doors and windows open for a few days. And while the back deck was open and great, the living room and kitchen were dark and uninviting. Luckily we didn’t spend any time inside! Overall it was a good experience. I would return to HBR but would pick a different unit. Thank you for posting a review for unit 6203 at the Hanalei Bay Resort. We are happy you had a good experience. The owners of the unit 6203 have plans to renovate so the carpet most likely will be replaced with some other type of flooring. As you mentioned the lanai has great size and views and is pretty amazing! Because the way the resort condos are designed, the living area, dining area and kitchen span from one side of the buiilding to the other side which does not allow for windows so the slider doors which do span the lenght of the room are the only light source. The covered lanai off the sliding doors also shades some of the light coming in. However the covered lanai is great for getting out of the sun and for rainy showers. All the condos at the Hanalei Bay Resort are this same design. We love staying at The Hanalei Bay Resort. The view never disappoints! Our condo was very beautiful and well equipped with almost everything we needed. Unexpectedly the electricity was out for the first 24 hours after we arrived. I looked everywhere for some candles and matches, but none were to be found. Also ran out of toilet paper:( The living room furniture should be cleaned soon. There was an unpleasant odor with all the rain. Not sure we would stay at this condo again only because we know there are nicer units in the complex. Thank you for comments and feedback. We are happy you found the unit to your liking and you had everything you needed! The unusual wind storm that Kauai got when you arrived was unfortunate and of course the power outages were out of our control and the whole island was dealing with it. We typically do not leave candles and matches in the unit as it can be a liability but we do have flashlights that we hope you did see. The unit below this unit was being renovated and the carpet pulled out so that might have been some of the smell that you experienced with the carpet sitting outside the lanai and the rain combined. The living room furniture is not that old but we will look into it being cleaned. The toilet paper is supplied with whatever is left on the wall mounted roll plus two extra rolls which is usually sufficieint for most guests but it is up to the guest to purchase if more is needed. If it is a longer stay and a midstay clean is required, then more toilet paper is supplied at that time. fantastic views of the Napali coast. Condo was very nice, well appointed. All beach accessories in condo, chairs, boogie boards etc...would stay there again.. The views from the lanai were amazing!! The condo was spacious and comfortable. We were pleased to see a washer and dryer in the unit. Everything we needed was in the kitchen. The unit could use an update but really we didn't spend much time inside. To get to the beach is a big walk but the resort does have golf cart service if you're willing to wait a bit. We just loved Kauai and Hanalei Bay Resort nestled in a quiet neighborhood (except for those darn roosters)! It is not really walking distance to bars or restaurants except the resort bar and evening restaurant so if you are looking for more of that you would have to drive into Hanalei. Princeville has a small Foodland grocery store and a little shopping center which is the closest retail to the resort. The North Shore area is much quieter and relaxing...just what we wanted! Thanks for your comments and taking the time to post. We are always happy to hear the condo worked well for you. We are glad you found it be be what you needed and everything that was accommodating. The updates because these are individually owned units are very specific to individual tastes and desires. The pictures on the website we post are very defining to see if this unit is what one would want. The views are most amazing!! Kauai is more of a rural type setting and most place do require a car to get to restaurants and or activities and shopping depending on how far you are willing to walk. The bar/lounge in the resort is on site and there are a couple other restaruants at the St Regis next door. Kauai is a very serene and relaxing atmosphere and that is what most guests are looking for when they come to Kauai. It is not like the hussel and bussel of Honolulu with the big city atmosphere and and wall to wall buildings. My Fiance and I stayed here for 3 nights and had an absolute blast! The room was clean, the bed was huge, the view was unreal. The resort staff couldn't have been more friendly and informative about the area. We would definitely stay at the Hanalei Bay Resort again. We only had 2 nights booked. While the condo was beautiful, well appointed, clean and the view magnificent, unfortunately the air conditioner was malfunctioning and dripping water in the bedroom. We were called to let us know a service person would come by to fix it. So, the complaint is that we couldn't check in until 3 pm of day one, had to check out by 10 am, paid $845 for 43 hours of beauty with a leaking AC and a service person scheduled to arrive at some point during our stay. Just left a bad taste. Thank you for your response to our review request for unit 6203 at the Hanalei Bay Resort. We are so glad you found the unit to be beautiful, clean and a great view! We are not sure what you are saying in the review about the costs, the check in and out times as this is what you had agreed to when making the reservation. The AC was leaking and as responsible management we did send someone to take care of it. The housekeeper just before your arrival let us know about it and we called right away and informed you that someone would be coming by to take care of it. They did come and you were not bothered as they did let themselves in while you were out and did take care of it. As you know the AC was cooling just fine, it just was leaking which we had put a bowl to catch the drips until the serviceman arrived. He cleared the lines and it no longer dripped but did leave the bowl as a precaution. We do try to service any issues as soon as we can and take care of our guests. Really enjoyed our stay in this unit. It is a spacious one bedroom with great views and the amenities at the resort are very nice. We would definitely stay here again. We've stayed here many times and this was one of the best condos (HBR 6203) we've rented. The view was amazing from the very spacious lanai. It was close to both pools and an easy walk down to the beach (coming back up was a little more challenging). The bed was very comfortable and the kitchen was well stocked. It really had everything we needed included boogie boards and beach chairs. We were happy to see the lounge was finally reopened, too. We hope to return soon. Beautiful condo with great views and a convenient location. Enjoyed using the resort facilities and the closet full of water toys/tennis rackets. This was by far one of the nicest condos in this area with unbelievable views and great accommodations. It was very clean, comfortable, and well stocked. The deck was lovely for breakfast and evening drinks. Resort services were excellent, including available parking everyday. Had a super time and would stay here again. The condo was perfect for our baby/honey moon! It was spacious and had everything we needed for our six night stay. We will definitely be back.The view is amazing from the condo itself and the bed was firm and comfortable. Screen doors may need a bit of love but did not stop us from enjoying time on the large deck. Kitchen was well stocked too. The location of the condo in the resort was perfect to the pool, parking lot, and short walk down to the beach. We love Hanalei! My wife and had a delightful 2 week stay in this condo. The condo was spacious, nicely appointed, well equipped and has a spectacular view of Hanalei Bay and the surrounding mountains. Sitting on the deck enjoying the sunsets was a great way to start our evenings.There were beach chairs, umbrellas and tennis rackets as well as a variety of other gear in the closet. We decided to stay at Hanaley Bay resort for our wedding and it was absolutely magical. The condo was spacious, very clean and had all the kitchen supplies one might need. The view is unbeatable and it takes you to paradise when you wake up. We will definitely come back and we highly recommend this place to everyone. You will not regret it- it's paradise.The people at the resort are very accommodating and incredibly friendly. The big pool by the resort was incredible and the beach access was very close.Can't wait to be back. Condo was very clean and had everything we needed. The closet was packed with beach chairs, the kitchen came with all the utensils and cookware, and the unit had both a washer and dryer. The views were second to none and the location of unit 6203 was perfect. My one complaint would be that the condo was somewhat musty, but we opened the windows and turned on the fan which took care of that pretty quickly. We do appreciate when our guest take the time to post a review for us. We are glad you found to unit to be clean and very accommodating. Of course the views are second to none. Tropical living can bring a mustiness but as you said the air flow takes care of it. It could have been shut up for a couple days inbetween guests. This condo is perfection! The view form the deck is outstanding.....looking out over Hanalei The rain in Spain Bay. Everything you need for your stay is provided. The kitchen is well stocked with virtually any cooking item you might require. The condo has just about everything needed for your beach days,. 4 beach chairs, boogie board, noodles, sand toys, coolers. The condo is very tastefully decorated and serene. The location is also great. The resort itself is beautiful. The pool is a tropical oasis, and the newly opened Happy Talk Lounge is a great pace to grab a fish sandwich when you don’t eel like driving into Hanalei Bay. We have stayed in this condo twice….and it is the only place we will stay when we head to Kauai. It is our own little piece of paradise! Overall the condo was excellent. Great view, well equipped, spacious, comfortable furniture including lanai. Could not keep the kitchen cabinet doors shut. We were very pleased and would recommend this condo. My husband, two kids and I stayed in 6203 for a week in August. The condo was clean, comfortable, well furnished, and the view was amazing! We spent each morning relaxing on the lanai looking out at Hanalei Bay and watching the chickens. We were so happy to find a closet full of beach toys, boogie board, chairs along with a well-stocked kitchen that had everything we needed. The soft bed was comfortable and perfect for our kids. We enjoyed the pool, beautiful walk to the beach, and dining out in Hanalei, which was just a quick drive away. Perfect vacation. I was pleasantly surprised with how well kept the unit was and how luxurious the furnishings were. I loved the living room. It was so comfortable. I will definately rent it again. We recently stayed in this nicely furnished, well stocked kitchen, comfortable king bed condo. Great views from the lanai, lots of space to stretch out or share meals, big screen TV w/cable, beach chairs and an easy downhill walk to the beach (they share the same beach as the St. Regis which is very nice for snorkeling or swimming). The condo property is great for tennis lovers (we are not, but there were numerous courts and lots of classes offered) and a beautiful pool and sports bar w/great food. Close to shopping for groceries, etc. Would stay here again when we return to Kauai. Thank you for your review. We are happy to hear that the condo was pleasing to you all around. The beach access is a plus as most places in Princeville to not have that option and the resort does have lots of wonderful amenities. We are glad to hear you would stay here again and certainly hope you do! Thank you so much for your review and letting us know how your stay went. It is so nice to get the good feedback on the unit and the cleanliness and of course the view is amazing! Thank you for noting the towel rack as we really love to get this feedback so we can take care of any issues as such. As you mentioned it is a tropical island and bugs do exist and you are right, we do have our units sprayed on a regular service. Thank you for noting that this unit was superior in that aspect to other units you have stayed in there. Thank you for trusting in us for your next booking! This place was amazing! We spent 11 nights in Unit 6203 with our 2 kids aged 2 & 9 months. I highly recommend this unit (& Hanalei Bay Resort) for families. The owners provided a high chair & play pen. The kitchen is fully equipped- dishwasher too! And being able to do laundry in our unit was an asset with littles ones!! The property itself is awesome- too bad the restaurant was still being renovated- but the food truck that comes Wednesday's is great! The beach access is stroller friendly (though you will get a good work out coming back up the hill) & it is a good beach for children (some shallow warm sections protected by reef, nice sand, and clean), as well the snorkeling is decent. The pool is fantastic, and what parent can argue with free poolside Mai tais on Mondays! No complaints at all. We will definitely be going back!! Mahalo!!!! No complaints at all is what we strive to hear! This resort and this condo are amazing! Thank you for your great review! We do try to think of everything that our guest will need in the units to make their stay a great one. The extra touches are what our guests keep coming back for such as the amenities like boogie boards, beach chairs, high chairs and pack n play which are all provided and more free of charge. This is a great and beautiful location and views cannot be beat. Please come again soon! I have stayed in Hanalei Bay 4 nights during our Hawaii roadtrip holidays, we stayed in few places in Oahu, Kauai and Mai and Hanalei Bay resport was THE BEST!First of all we got upgrated to a condo with Ocean view for free (6203 condo). Thank you again! The view was breathtaking and the condo was spacious like 75-80m. and comfortable (fully equiped kitchen). Just perfect. Shame we did not use the pool or other resorts attractions as we were intensivelly sightsing around the island :) :) :)Also very helpfull concierge service that helped us book the helicopter tour! Thank you for voting us the “BEST” amongst the different accommodations in your experience. We are always happy to hear about our guests who do appreciate what we work so hard at. This location in Princeville is one of the most beautiful views on the island and this condo takes it all in. We know the island does have lots to offer as far as activities and understand that you did not get to enjoy the resort amenities but we do hope you can come back again and enjoy them on your next stay. For what we paid, i think we could have found a nicer condo. It was well-equipped, and in a fabulous location with wonderful views. But we weren't told beforehand that the resort was being renovated and hence there was no restaurant The furniture was quite tired and it all felt a little sad. Granted, the bathroom had just been renovated and looked lovely. And I know that we were on a tropical island but finding a large cockroach in the kitchen didn't make me happy. Awesome place! Well furnished & beautiful views! All provided items were appreciated - fully stocked kitchen and beach items. Only compliant was that the phones were not working throughout our stay. Would highly recommend and visit again. Staff was friendly and accommodating. This condo was perfect for our needs. The view is better than in the pictures. We treasured the mornings on the patio drinking coffee and enjoying the view. The King size bed was comfortable and the spacious shower and unlimited hot water was wonderful! We spent lazy mornings and evenings watching movies on the large TV in the living room. The kitchen came with all the supplies we needed (although we really dislike the stainless pans- difficult to make breakfast with). The closet was equipped with tons of beach supplies. The resort staff was very friendly and we utilized the pickup service for rides to our car or to the beach. It was a very quiet resort. The Wifi worked great. We used the washer/dryer a lot to keep up with laundry. The condo was clean, comfortable, and well stocked; I would highly recommend it!!! Put simply, the unit is very functional and nicely furnished. Numerous additional amenities really made the trip better (tennis racquets, boogie boards, beach chairs). Oh yeah, the view is ridiculous. We got up every morning and watched the surfers at the break on Hanalei Bay (way out there) from our lanai and it was amazing. The unit is nice and spacious which was also a nice perk. The grounds of the resort are immaculate and it's only 10 minutes by car to the pristine beach on Hanalei Bay. The service at the resort was responsive and friendly, no complaints whatsoever. There are 2 great golf courses within 5 minutes of the resort and they are both top notch as well. We loved our trip and can't wait to come back. With this unit, the view on the bay is beautiful. The bed is very comfortable and the video TV system is very good. The area is great as are the tennis court. There is a good shuttle service and nice pool. But there is not much natural lighting in the unit. The photos does not show what you see. It is dark when raining. It is sometime noisy (lawnmayer, air machine pushing...) (I am not including roasters at night because it's part of the trip). Some items are missing in the unit. For example there is one glass of wine! The bathroom would need some refresh (ther were some ants but maybe it's because nobody came in the unit for many days before us). Anyway, it was clean. It would also be nice to have a salad winger, a expresso machine. It's a old style furniture, kind of heavy style that is not adapt in the beautiful environement. This is a great condo. The kitchen is well equipped which made making food a real pleasure. It's not too far to walk from the parking lot and of course it has an awesome view! Aloha Condos provided an awesome little welcome kit and even though the Resort is and has been under construction for a long time, we noticed a marked improvement in overall service and maintenance of the property. This was our 4th visit to the resort. We were very pleased with our stay at the Hanalei Bay Resort #6203. We will definitely stay there again whenever we return back to Hanalei. The view from the condo was fantastic and the furnishings very nice and up to date. I never tired of the view. Seriously, it was awesome. If you book this condo, you will not be sorry. A Beautiful Home away From Home! We stayed in this condo for one week and it was absolutely wonderful! It was clean, gorgeous, and comfortable. It had all the conveniences of home. We used the heck out of the little cooler on all of our outings! :) The view of Hanalei Bay was a major plus!!! You can't get a view like that with all the extras our condo had for a better price. What a diamond in the rough. I recommend to anyone who doesn't mind a little drive to get to other areas of the island because this is located on North Shore and much of the island's happenings are more to the East. We stayed at the Hanalei Bay Resort in Condo 6203 for the first time & absolutely loved it! The Hanalei Bay/Princeville area on the North Shore of Kauai is the most beautiful area, & the condo was in a great location to reach all of the prettiest places. The condo itself was even better than we expected: perfectly clean, an excellently stocked kitchen with high quality appliances and pots & pans, comfortable bed & air mattress, a beautiful view from the living room and bedroom, and a quiet community. We would recommend it to anyone and will definitely be coming back to stay here again the next time we come back to Kauai. The service from Kristen Greene, the property manager, was also more than expected. Our last day of our stay was when the tropical storm Flossie was supposed to arrive, and Kristen went out of her way to call us that morning to make sure we were ok and were prepared for the storm. She even told us that if our flights got canceled, that she would make sure we had a place to stay that night! We really were pleased with this condo & highly recommend it! Also, the Hanalei Bay Resort had some complaints on yelp for construction going on, but we didn't hear a single thing! So don't have any hesitations to come here. My husband and I so enjoyed your condo for our one-week stay in april. The view from the lanai was great. The water feels closer than it looks in the pictures. Furnishings were lovely, kitchen was nicely equipped as was the closet full of beach equipment: umbrella, chairs, coolers, snorkeling equipment, float for the pool, etc. This was our first stay in Hanalei, and we had fun exploring the town. Loved Postcards for dinner. I would only change one thing: 'relocate' the rooster that starts crowing at 3am and continues off and on all day! Heaven on Earth! Cannot wait to return. The condo itself is gorgeous, and has an amazing balcony with view of the ocean, mountains, grounds and pool (but not too close to the pool, for noise concerns, and is the smaller of the two resort pools). It also has a full kitchen with everything you'll need to make meals, a dishwasher, blender, toaster, microwave, washer/dryer... They also have gear for the pool and beach! Beware of roosters who will start crowing around 4am... I guess it's all part of the experience though! The resort is absolutely wonderful, with two pools, a hot tub, 6 tennis courts, daily activities, concierge, and the beach and St. Regis is less than ten minutes away. I cannot wait to return to this place, aka heaven on earth! This unit is updated with modern, clean, new furniture. The views are breathtaking and you leave wanting more. Wonderful place to stay in Kaua'i! Thank you, Kristen, and all the friendly staff at aloha Condos for helping us organize our stay at this beautiful condo. Clean, well equipped kitchen. Comfortable layout in the condo. Outstanding view from a very private lanai. Very nicely maintained grounds. Hanalei Bay Resort Condo 6203 was as beautiful as the pictures show it to be. The living room/dining area were great for entertaining and the view was incredible. The bedroom was beautiful and very comfortable. The kitchen is a bit dated, but very functional. The laundry in the unit was a plus!The condo was priced higher than some of the other condos and was worth the price we paid, at the time and would stay here again. The pool at the resort was just being finished as our stay ended and we were able to spend a day relaxing there! This condo was nothing short of perfect. It was spacious, beautifully decorated, very well equipped with nice kitchen amenities, plates, silverware, etc... and even came equipped with tennis racquets, dive masks and snorkels, etc. The view of Hanalei Bay is spectacular, from the very comfortable lanai decks off the living room and bed room. The condo has very good WiFi connection, a large flat screen TV in both the living room and bedroom, and a very comfortable bed. The staff was very friendly and helpful... the path to the private beach (well... it is shared with nearby St. Regis Hotel, but is not accessible to the public) was a beautiful adventure in itself. I cannot imagine what else could have made our stay more pleasant. We can't wait to return! Lovely unit, very clean and had everything needed for a wonderul and relaxing stay.Pools, Golf, Tennis, Store right there.Would recommend. Condo 6203 was a perfect condo! It was clean, and had all the greatest amenities, including beach chairs and floaties for the pool! The condo was spacious, comfortable, and was fully equipped. The location was perfect within the resort- close to the pools, but not too far from the parking lot. Unfortunately the restaurant which was due to open soon, suffered a fire a week before we arrived. At least there was a grill near the pool everyday for lunch, which was great. We rented this condo after a paddleboard race my husband competed in from Molokai to Oahu. We had not been to Kauai since our honeymoon in 1978 and now I wonder why we waited so long! I was curious to see if the condo would be as great as the pictures looked. It did not disappoint. The view from the living room and bedroom was just as pictured. The view of Hanalei Bay is spectacular and this condo made it easy to enjoy. As we began to unwind, we started to notice all the amenities that the owners have provided for their guests: wonderful beach chairs, tennis rackets, coolers, etc. The condo came equipped with everything a renter would need to enjoy the beach, pool or tennis courts. Since dining out is so expensive, and not all that great, we also took advantage of the well stocked kitchen. The cookware is the same that I use at home so I felt right at ease. And, the knives were quality and sharp. How often do you find that in a condo? The furniture and decor was very tasteful and comfortable and I felt like I was living in my own home for the week that we rented. The condo was fantastic and the setting of the Hanalei Bay Resort is beautiful. Yet, I would say that the resort needs some tweaks. The waterfall pool is movie quality. Since the restaurant is gone, the boarded up walkway leading from the pool to the lobby detracts from the beauty of this setting. In an effort to provide guests with some poolside amenities, a tent has been set up to grill lunches. However, this temporary structure also looks quite tattered next to this stone pool. And, finally, the outhouses, although sort of hidden. Really? These should be addressed and then this beautiful ambiance would be even better. The tennis courts, towel service, cart service and grounds were incredible. These small tweaks would only enhance. This is a great place and a fantastic condo. I hope that the lobby, restaurant, and lounge will reopen but I realize that the economy may play a factor in that. However, we still enjoyed our time here and will definitely come back to this condo! This is the most beautiful island. It did rain a lot, which was unusual this time of year, but that's what makes the island so lush and beautiful. We loved the cleanlines and modern appeal of the condo as well as the scenery from our deck.The only down side was phone by beach was out of order, so my husband couldn't walk down due to health reasons. He went one time with the understanding we could phone for a golf cart to bring him back up. Beautifully decorated, comfortable unit with unbelievable view. Kristen was great to work with making the reservations. She also had a gift bag waiting for us in the unit which we truly appreciated. The people who work at the resort are super nice and accommodating. The unit #6203 has been upgraded and professionally decorated. It is super nice and comfortable with upscale furniture, accessories and big flat screen televisions. The very large deck with really nice, expensive patio furniture allows you to feel a part of the magnificent view this unit has to offer of Hanalei Bay and the mountains...I believe Bali Hai. You can see white water views of the Bay and incredible sunsets from everywhere inside the unit and the extra large deck. Seriously, the view is off the charts. We would stay in this particular unit every time we come back to Kauai/Princeville if it is available. I never get tired of that beautiful view! Bed was comfy, kitchen well-equipped. Love it, love it, love it! My husband and I recently stayed at Hanalei Bay Resort, celebrating our 5th anniversary. Our experience there exceeded our expectations in every way. The condo itself was well-maintained, beautifully furnished, and had an incredible view - perfect for the glorious sunsets. The staff was very friendly and helpful. The beach at the property was lovely (though a bit of a walk), and the proximity to what we consider to be the best beaches on Kauai made it ideal, as we like to explore, snorkel, etc. The only problem we experienced while staying at the resort was other guests not following the no-smoking policy. We finally complained to the front desk about the people staying below us, and they took care of it right away. Other than that, perfection. We would definitely stay here again!! I absolutely would recommend this condo to anyone looking to stay on the North Shore of Kauai. The setting is just beautiful and our mouths dropped wide open when we opened the slider door to the view from our balcony. Just breathtaking from all angles! The management staff for the condo was wonderful. We had one snag during our stay with a broken piece of furniture and they rectified it very quickly. The condo is very well maintained, updated nicely, and well stocked with kithchenware and beach gear. Also, having air conditioning was fantastic! It's quite hot on the island and coming home to a cool place each day was great. If we ever make it back to Kauai we plan on staying in this very condo... I wouldn't have changed a thing! We stayed at Hanalei Bay Resort for 9 nights aug/Sept 2010. Our stay in unit 6203 was great. Beautiful views from the Lanai. We sat there almost every morning and evening to look at Hanalei Bay. The Beach gear was also very useful. The resort pool was nice, but we typically drove to a nearby beach. It would be great if they had more shade/umbrellas at the resort pool, there were only two for the entire pool. We would definitely stay here again. Everything was wonderful... the condo was beautifully decorated, very comfortable, well-stocked, and the view from the lanai was breathtaking. It would have been good to have a broom and/or vaccum cleaner in the unit, though. But the only real problem we had was some inconsiderate neighbors from time to time, people smoking on their lanais, parents letting their children yell and play on their lanai as early as 6:00 am, a group of young women laughing and talking loudly outside on the lawn at well past 11:00 pm. When we politely asked them to take their conversation inside, they were rude and told us we should shut our own doors. We did not come to Kauai to shut ourselves up in a stuffy condo, but to enjoy the sights, sounds, smells and solitude of paradise so this was a real disappointment. Maybe the quiet time hours need to be stressed more during the check in process? Nevertheless, we will be back - and none too soon! Thank you! Amazing condo, we hope to come back soon! The condo and Hanalei Bay Resort exceeded our expectations. The furnishings were beautiful, we especially loved the outdoor patio furniture. It was so much nicer than what most of the other units had. The kitchen was well stocked with all the cooking/dining items we needed. We had a wonderful trip and hope to return to this condo again on our future trips to Kauai. I grew up on a house on the beach Oahu so I have pretty high expectations for a vacation spot anywhere in Hawaii. We (my husband and two kids ages and 12) loved staying at the Hanalei Bay Resort - esp. at condo 6203. But we really hope our review doesn't mean that we won't be able to stay there next time we go to Kauai because its booked! Great service from the manager who came within an hour when we arrived and weren't able to find the inflatable bed for our kids to sleep on. She not only drove over and pulled it out of a locked closet but even inflated the bed for us - and offered to put the sheets on (we told her that wasn't necessary!) The condo has been beautifully remodeled - the only area that can use an upgrade is the kitchen but it was absolutely fine for our 4 night stay. Kristen gave us an excellent rate and was excellent to communicate with. We felt so comfortable there that we are definitely planning to return in two years to celebrate our 19th anniversary (that is if she can book that far ahead). The Resort, Property Management Company and Unit were all top notch and I would recommend this unit to anybody. The vista from the living room and bedroom is second to none. Had a fantastic stay at the Hanalei Bay Resort! Loved the condo and all of the resort's amenities. It was nice and quiet since the parking is all out front, and we didn't miss having Happy Talk or the restaurant at all! Having our own kitchen was great, and we saved lots of money by preparing meals at the condo. Location can't be beat! The breathtaking views of Hanalei Bay from the 2 lanais were almost unbelievable. Enjoyed exploring the area. We'll be back! Great condo! Very comfortable! My wife and I like the Hanalei Bay Resort. We missed not having the Happy Talk Lounge and Restaurant open but other then that everything was good except the roosters (JK)! It's Great Just Stay there!! Great one bedroom condo with an amazing view of Hanalei Bay. The whole resort was very helpful and timely. You will enjoy your stay. Nicely remodeled and spacious with great views! Condo 6203 was very nice - it was in a great location and had amazing views. The unit is also close to the main pool which was very handy. The unit has been nicely remodeled and all of the finishes are very well done - great choice of furniture, etc.. The master bed is very comfortable! The kitchen is relatively updated and nicely stocked with practically all the kitchen utensils you need. The resort is quiet b/c the parking is all in the front. The pool areas are beautiful. This condo is wonderfully decorated and has a great view of the bay. The balcony is not private but is fine for hanging out. The pool and tennis courts are steps away. To get down the beach is a 5 min walk through a pretty tunnel of greenery. The shopping center on the main road would be a bit far of a walk but possible; it's only a 5 min drive. We had a wonderful time here. The resort is beautiful. It was very well maintained and the landscaping was excellent. The staff was friendly and helpful. 6203 was in perfect condition, had everything we needed, and extra touches that made our stay special. We especially loved the lanai with the gorgeous view. The bed was very comfortable and everything inside was spotless. It's a very short walk to the pool, down to the beach (steep, but not too long). Photos don't do Kauai or this condo justice! Fabulous updated condo with everything you need stocked (any kitchen tool you need, ziplocks, soap, detergent, foil, saran wrap, coffee filters, etc...oh and beach chairs and cooler were key!) Pack and play in the closet too - we don't have kids but if you do, a huge plus. Great a/c, beautiful furnishings, huge flatscreen HDTV/Blu Ray, nice kitchenware, good linens/towels, laundry, nice patio furniture, iHome clock/stereo in both rooms, comfy bed, spotless condo. The view FAR surpasses the photos - the ocean is much closer than it appears in pics and you can hear the pounding waves as you watch the sunset over Bali Hai from the balcony every night. We arrived in the dark and literally gasped at the view the next morning once we realized how awesome it was. North shore is the BEST! I cannot imagine staying on the south shore once I've seen the north. Incredibly beautiful, not crowded or touristy, and the Princeville complex is great. Super running trails, nice mixed use community (houses, villas, condos, resort, golf courses, playgrounds, good grocery store, etc.) Hanalei town very close with many good restaurants too. Easy to drive all over the island as it is small but renting a car is a must. We travel a lot and highly recommend this place! Absolutely FABULOUS condo in a ridiculously wonderful setting! :) Don't think twice - book it! We'd return in a heartbeat! This is a very beautiful condo and we loved staying there. Everything inside is lovely and new, beautifully decorated, and the view from the lanai is amazing. We loved having breakfast out there, watching the birds and listening to the waves. The resort grounds were very nice and swimming in the pool was fantastic. I would love to stay here again!